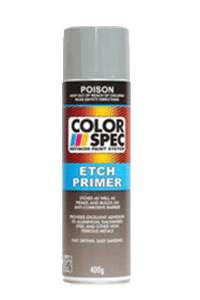 ColorSpec Etch Primer is a chromate free single pack spray treatment designed to promote maximum adhesion to both ferrous and non-ferrous metals. Anti Corrosive properties protect the metal prior to painting. ColorSpec Etch Primer is ideally suited to be used in conjunction with ColorSpec primers and base coats as well as other acrylic or enamel top coats. Ideal for automotive and industrial applications.